The Aura HD, though pricey, represents 25% of Kobo’s sales. 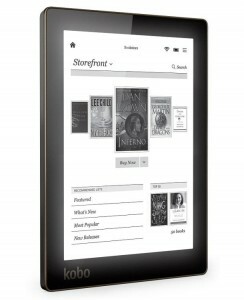 Not only are the six and seven inch tablets seeing reboots, but Kobo has added a ten-inch tablet. Which means, according to DBW, that the company is positioning itself as being focused on the reading experience, especially with features such as “Reading Mode,” which allows the user, among other things, to turn off notifications from other apps on its tablets to keep distractions at a minimum. Shelf Awareness adds that “Kobo has also signed a number of magazine publishers and will showcase their titles using the Guided Reading experience, which replaces panning and zooming around a page with a one-tap interface. Digital Book World says that, “The sweeping upgrade for the ebook retailer and device-maker across its business is part of an effort to help it build market-share in the U.S. and to continue to expand globally, according to Kobo executive vice president and manager of devices, Wayne White. The company is thought to have ebook sales market share of somewhere around 3% in the U.S. In Canada, where the company is based, it is thought to be a market-share leader. The company sells ebooks in over 190 countries and devices in several dozen.